According to Harris Insights, almost one in ten Americans (or about 8 percent) was invested in cryptocurrencies at the end of August 2018. The majority of people potentially interested in investing in cryptocurrencies were young people with less income. The majority of those polled who said they were not interested claimed that cryptocurrency markets are a type of “Wild West” market. Explicitly, the high volatility of prices were the reasons for their aversion. This indicates that there are certain beliefs about the current market situation as a result of a profound lack of knowledge regarding investments. This appears to a global phenomenon and one that affects women more than men. First of all, of course it is fact that unpredictable elements in all investment, not only cryptocurrencies, pose risks. Our reasons we are afraid of risk is that studies have shown the bad feelings investors experience from losing money are roughly twice as strong as the joy that they feel when we gain the same amount of money! Now this is quite the statement! To make matters worse, this pain may lead an investor to hang in too long. Investors even avoided the rational decision to sell just in order to avoid the pain of realizing a loss. And all this while putting them at greater risk for even higher future losses. Why this type of emotionally charged investing so dangerous? And how could people learn to invest strategically? For starters, educating yourself in the fundamentals of investing is vital. So how comfortable are you with your financial life?Understanding a number of things before starting to invest is mandatory. Of course, one article or even a number of articles would not be enough to summarize this information. Thus, this article is not comprehensive in any way, nor is it investment advice. All investment into cryptocurrencies is taken at your own risk. Rather, it is to point out some basic concepts for further education and research for those potentially interested in investing in a language that is easily understandable. Let’s start with the most fundamental of fundamentals today. Don’t worry if you already know all this and don’t be offended if you are smarter than the rest and we are picking up here. We are going to get more into actual investing questions in the next parts coming up. The first very basic question: What is an asset? In the broadest sense, an asset is something that puts money in your pocket by generating income / cash (flow). So, let’s say you want to build your assets. Would you go and buy a house to live in? It’s hopefully going to be worth more in ten years, right? (This we call “appreciation in value”. ) Let’s suppose you have borrowed money to pay of this house of yours. This means, right now it is not an asset but a liability. However, your house is an asset to your lender. He is making money off you and your debt is generating cash flow in his pocket. Once you have actually paid for your house, and own your house and live in it, despite appreciation in value, it is still, in all likelihood, a liability. You still pay taxes for it and pay for its upkeep. Once you sell the house, you will mostly likely find that the money you have spent on upkeep is much more than you made from appreciation. Therefore, the question whether your house is an asset remains dubious. What is a liability, anyways? Liabilities are ventures and things that cost you money and remove money from your pocket. This means your house is a liability for you while you pay off your debt for your house as long as you do so. Only if you rented out your house for others to live in and “make money” by generating rental income while receiving more income than you are actually spending on your house, would it be considered an asset. In any case, the bottom line in investing and life is: You want to increase assets and decrease liabilities. And What About My Car? I paid for it! Unfortunate news is that in this context your car, classified as a depreciating asset by some, is most likely a liability even after it is payed off, unless you are using your car to generate cash flow, like for an example an Uber driver. A depreciating asset is an asset that loses value over time – a brand-new car begins to lose value the minute you drive it off the lot the first time. But back to real and investing in definite assets. Other examples for assets, besides income-generating real estate, include successful altcoin staking, investment in long-term price-appreciating cryptocurrencies, running a masternode, dividend-paying stocks, interest-paying bonds, royalties and patents. And in the long term, investing in yourself through education is most certainly one of your most valuable assets. Are you aware of the financial assets and liabilities in your life? 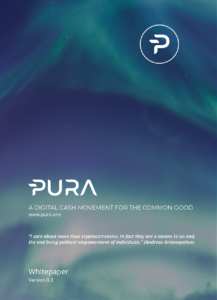 Please note this PURA article is merely for purposes of information and does not serve as investment advice or financial service. Trading and investing involve substantial risk of financial loss, including loss of principal and all trading and investing you pursue is at your own risk.